Mendoza is a city that has been destroyed by earthquakes more than once. The city fathers have designed the city with wide streets and lots of open space for people to shelter when the next one hits. The parks features fountains and beautiful gardens, but we didn’t see it at its best. When we were doing a tour of the city a major windstorm hit whipping up a mighty dust storm. The hill that offered a view of the city was closed because it was too dangerous to drive up the road. Trees were down everywhere closing many of the city streets. The next day we learned that two people died in the storm, one of them a motorcyclist who was either blown off his bike or hit by a falling tree. 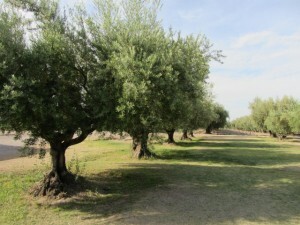 The Mendoza region is known for its wine and olive oil. We got to visit two of the wineries and an olive oil factory. 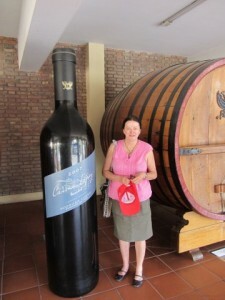 One of the wineries, Lorenz, is more than a hundred years old and uses massive French oak barrels, some 35,000 litres. Here we’ve got to try the local sparkling. It was a very good drop. Unfortunately our hotel room doesn’t have a fridge so we have to pass on buying a bottle. We do buy a bottle of the local Malbec – a fine wine that Argentina is famous for. The next winery – Vistandes – is much more modern with massive stainless steel tanks and a tasting room with plush couches and views over the vineyard. Here we got a lesson on how to taste wine – all very posh! We also got to see the owner’s private cellar that included his best wine. It is so good he doesn’t sell it and only opens a bottle for special occasions. The olive oil factory was a modern processing plant that only needed three people to operate the equipment, but it would be a different story during the harvest. One hundred year old olive trees produced 100 kilos of olives each year and these are picked by hand. After a couple of days it was time to move on so we left Mendoza and headed to San Raphael and then down Ruta 40 to Malargue and then on to the Lakes District. 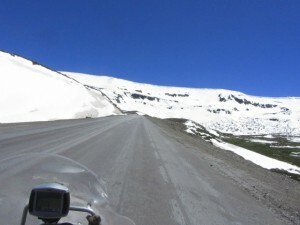 The ride to San Raphael was great but from there to Malargue we hit Ruta 40 at its worst. What begins as a slight wind builds and builds and builds. We can see a haze on the horizon. It is the dust being whipped up – just like in Mendoza. There is nothing to protect us and the wind gets stronger and stronger. The ride is hideous for rider and pillion. 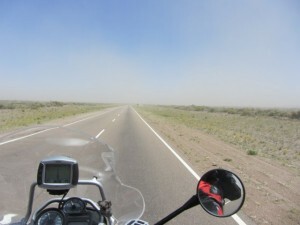 We travel for about 200 ks with the wind buffeting us, covering us in dust. Unfortunately this is just a taste of what we are in for! Bloody hell! From Malargue we decide to cut and run for the Andes – we just love those mountains – and head to the Lakes District on the Chilean side. There is a pass quite near here. It is marked on the map. It is on the GPS and there is a very large sign saying Republic de Chile at the intersection. It’s just a pity no one bothered to put up a sign saying ‘border closed’. The beautiful sealed road through the foothills of the Andes deteriorated into a dirt road and then a goat track. By this time we were high up in the Andes, above the snow line. 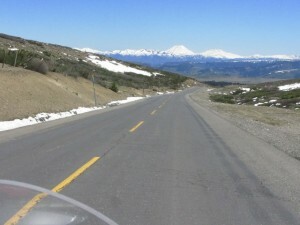 This clearly wasn’t the road to Chile so we headed back and took Ruta 40 again, heading south. Some of the road was paved but there was plenty of gravel to test the bike and us. We made it through to Chos Malal and found a bed for the night. This can't be the road to Chile! This definitely isn't the road to Chile! In the song Don’t Cry for me Argentina Eva Peron sings ‘I never left you’, referring to her beloved Argentina. Well, it seemed like we couldn’t leave either! After a spectacular meal from the ‘grill’ that Argentina is famous for and good sleep we needed to get fuel and then head for the border. There was just one problem – there was no petrol. It might arrive at midday or it might arrive at 5.00 pm. No one knew. We decided to get a room for another night. We kept checking on the fuel situation and there was no news. At 8.00 pm we went and queued up with the locals. It was an orderly queue. This obviously wasn’t the first time they had no fuel. When the truck arrived at 9.00 pm they didn’t raise a murmur. We cheered! At 11.00 pm we had a full tank of fuel and headed to find something for dinner. That wasn’t a problem. Eating early, like 7.00 pm, is a problem here. Midnight – no drama! Finally, we left the next morning and travelled through Paseo Pino de Hachado to Chile. 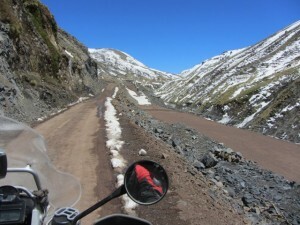 The Andes are truly amazing and this pass took us right up to the snow on a magnificent paved road. Brian had a blast! The border crossing was simple. Leaving Argentina we got all the papers signed and some travel advice from the customs bloke, telling us where we should visit in South America. We drove through no man’s land to the Chilean crossing. The paperwork was more extensive here, but we expected that. Chile is driven by paper and stamps! Quarantine wanted to check the bike and chose Shirl’s pannier. He stuck his hand into the mass of clothing and gave up on the idea of checking the rest of the bike. He did show some interest in the sheepskin seat covers until we told him they were from Australia. 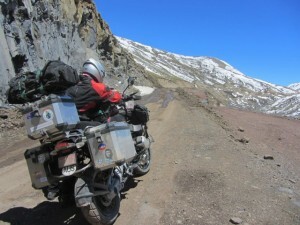 We were right to go – back in to Chile and head to Pucon in the Lakes District!